Traditional techniques such as print and TV advertising used to generate web site traffic. The customer's purchase decision is influenced by a range of media such as print, TV and Internet. Communications are broadcast from an advertiser to consumers of the message who are passive recipients. The consumer is proactive in selection of the message through actively seeking out a web site. Through understanding the key interactive communications characteristics enabled through digital media we can exploit these media while guarding against their weaknesses. In this section, we will describe eight key changes in the media characteristics between traditional and new media. Note that the 6 Is in Chapter 1 provide an alternative framework that is useful for evaluating the differences between traditional media and new media. Traditional media such as print, TV and radio are push media, one-way streets where information is mainly unidirectional, from company to customer unless direct response elements are built in. 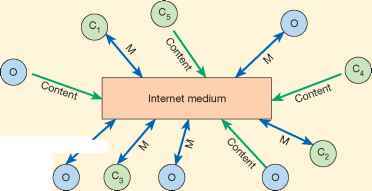 In contrast, the web is an example of pull media. This is its biggest strength and its biggest weakness. It is a strength since pull means that prospects and customers only visit a web site when it enters their head to do so, when they have a defined need - they are proactive and self-selecting. But this is a weakness since online pull means marketers have less control than in traditional communications where the message is pushed out to a defined audience. What are the e-marketing implications of the pull medium? First, we need to provide the physical stimuli to encourage visits to web sites. This may mean traditional ads, direct mail or physical reminders. Second, we need to ensure our site is optimised for search engines - it is registered and is ranked highly on relevant keyword searches. Third, e-mail is important - this is an online push medium, and it should be a priority objective of web site design to capture customers' email addresses in order that opt-in e-mail can be used to push relevant and timely messages to customers. All these techniques are described further later in this chapter. The medium enables a dialogue between company and customer. Creating a dialogue through interactivity is the next important feature of the web and digital media such as mobile and interactive TV which provide the opportunity for two-way interaction with the customer. This is a key distinguishing feature of the medium according to Peters (1998), and Deighton (1996) proclaimed the interactive benefits of the Internet as a means of developing long-term relationships with customers as described in Chapter 6. For example, if a registered customer requests information, or orders a particular product, it will be possible for the supplier to contact them in future using e-mail or personalised web messages with details of new offers related to their specific interest. But digital dialogues have a less obvious benefit also - intelligence. Interactive tools for customer self-help can help collect intelligence - clickstream analysis recorded in web analytics can help us build up valuable pictures of customer preferences. Mass customisation is the creation of tailored marketing messages or products for individual customers or groups of customers typically using technology to retain the economies of scale and the capacity of mass marketing or production. Web-based personalisation involves delivering customised content for the individual through web pages, e-mail or push technology. Traditional push communications are one-to-many, from one company to many customers, often the same message to different segments and often poorly targeted. With digital media 'one-to-some' - reaching a niche or micro-segment becomes more practical - e-marketers can afford to tailor and target their message to different segments through providing different site content or e-mail for different audiences through mass customisation and personalisation (Chapter 6). Note that many brochureware sites do not take full advantage of the Internet and merely use the web to replicate other media channels by delivering a uniform message. Potentially digital media provide a one-to-one communication (from company to customer) rather than the one-to-many communication (from company to customers) that is traditional in marketing using the mass media, such as newspapers or television. Figure 8.2 illustrates the interaction between an organisation (O) communicating a message (M) to customers (C) for a single-step flow of communication. It is apparent that for traditional mass marketing in (a) a single message (Mj) is communicated to all customers (Cj to C5). consumers can interact with the medium, firms can provide content to the medium, and in the most radical departure from traditional marketing environments, consumers can provide commercially-oriented content to the media. 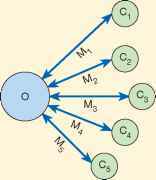 This situation is shown in Figure 8.2(c). This potential has not yet been fully developed since many companies are still using the Internet to provide standardised information to a general audience. Despite the reference to a new paradigm, it is still important to apply tried and tested marketing communications concepts such as hierarchy of response and buying process to the Internet environment as described in the online customer behaviour section in Chapter 2. However, some opportunities will be missed if the Internet is merely treated as another medium similar to existing media. New media also enable many-to-many communications. Hoffman and Novak (1996) noted that new media are many-to-many media. Here customers can interact with other customers via a web site, in independent communities or on their personal web sites and blogs. We will see in the section on online PR that the implications of many-to-many communications are a loss of control of communications requiring monitoring of information sources. Digital media are also intense media - they are lean-forward media in which the web site usually has the visitor's undivided attention. This intensity means that the customer wants to be in control and wants to experience flow and responsiveness to their needs. First impressions are important. If the visitor to your site does not find what they are looking for immediately, whether through poor design or slow speed, they will move on, probably never to return. In addition to offering the opportunity for one-to-one marketing, the Internet can be, and still is widely, used for one-to-many advertising. On the Internet the brand essence and key concepts from the advertiser arguably becomes less important, and typically it is detailed information and independent opinions the user is seeking. The web site itself can be considered as similar in function to an advertisement (since it can inform, persuade and remind customers about the offering, although it is not paid for in the same way as a traditional advertisement). Berthon et al. (1996) consider a web site as a mix between advertising and direct selling since it can also be used to engage the visitor in a dialogue. Constraints on advertising in traditional mass media such as paying for time or space become less important. Consumers are looking for information online all the time, so advertising in search engines in short campaign-based bursts is inappropriate for most companies - continuous representation is needed. Peters (1998) suggests that communication via the new medium is differentiated from communication using traditional media in four different ways. First, communication style is changed, with immediate, or synchronous transfer of information through online customer service being possible. Asynchronous communication, where there is a time delay between sending and receiving information as through e-mail, also occurs. Second, social presence or the feeling that a communications exchange is sociable, warm, personal and active may be lower if a standard web page is delivered, but can be enhanced, perhaps by personalisation. Third, the consumer has more control of contact, and finally the user has control of content, for example through personalisation facilities. • feedback - this occurs through online forms and through monitoring of on-site behaviour through log files (Chapter 9). 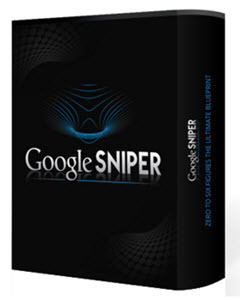 Are YOU Ready to Climb Your Way Up The Search Engine Rankings and Start Getting the FREE Traffic You're Looking For? Hundreds of places claim they can give you top rankings...but wouldn't you rather just learn how to do it on your own so you can repeat the process on any future site you build? 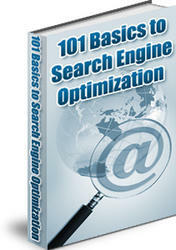 101 Basics To Search Engine Optimization. Tried and Tested Methods Revealed! What are the characteristics of interactive marketing? What are the important of interactive market communication? What are the characteristics of interactive advertising?